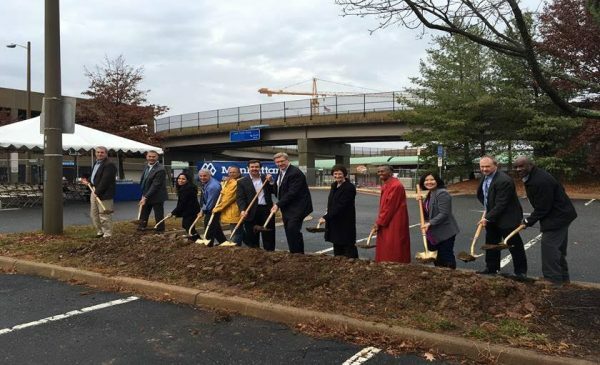 A groundbreaking ceremony was held Wednesday to kick off construction of a new parking garage at the Herndon-Monroe Park and Ride, which will service the forthcoming Herndon Metro Station as part of the Silver Line extension. Several local elected officials were on hand with shovels to make the first ceremonial dig, including Fairfax County Board of Supervisors Chairman Sharon Bulova. “As we celebrate the ground-breaking of this new multi-modal parking facility, we reaffirm our efforts to provide alternatives to single-occupancy vehicles, to improve mobility, and to provide greater opportunities for people to connect with the entire metro region and the rest of the world,” Bulova said in a statement. The new garage will have spaces for 2,007 cars, as well as feature a pedestrian bridge leading from the new garage to the future Metro station, and connections for both cars and pedestrians to the existing Herndon-Monroe Park and Ride lot, which contains 1,745 parking spaces. The new garage also will have secure bicycle storage facilities, a spot for bus pick-offs and drop-offs and a “kiss-and-ride” area. Construction of the garage, done by Manhattan Construction Co., will cost $44.5 million, and is expected to wrap up in the spring 2019, Fairfax County officials said. Though officially named the Herndon Metro station, the stop is technically located at 12530 Sunrise Valley Dr. in Reston, just across the street from the border with Herndon.